This trick could save you lots of time and money. Everyone recognizes boring office bathrooms — complete with gray cement floors and piping on full display under the sink. Luckily for the employees at this office, those formerly bland spaces got a major upgrade. 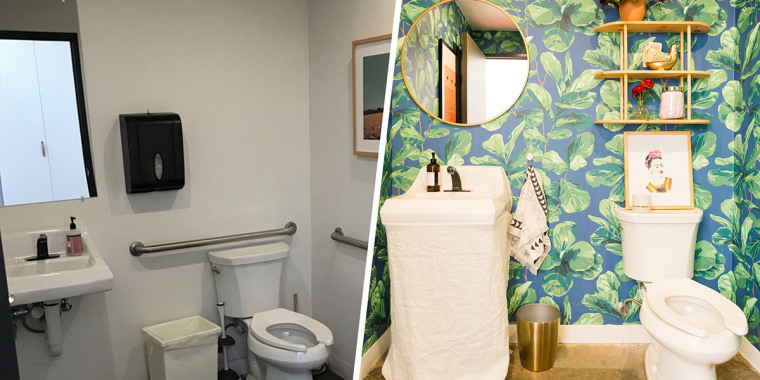 Aisling Mittman, VP of brand and design at Hutch, decided it was time for to overhaul the bathrooms in the company's Culver City, California, office. Mittman transformed the spaces with fun wallpaper and a $20 hack that completely changed the feel of the rooms. "We were drawn to the bright colors and the natural patterns of the wallpaper, which really was the foundation of the space," Mittman told TODAY Home. "We mixed patterns and colors with the rugs and washcloths, and added fun decor and art to the space." In addition to the bland walls, one glaring downside of the original bathrooms was the piping under both of the sinks. That said, tearing out perfectly functional sinks didn't seem like the best option — especially when the budget for both spaces was under $2,000. That's when Mittman came up with the perfect fi: She purchased a tablecloth, grabbed a glue gun and made magic happen — for only $20! "The only cost associated (with the hack) was the tablecloth, which was $20 per sink," said Mittman. "We already had a glue gun in our office." The resulting look not only covers up those less-than-ideal exposed pipes, it's downright flattering. Mittman has another big tip for people looking to update their bathrooms. "Lighting is key," said Mittman. "Make sure you have an option besides just overhead so your guests feel beautiful." According to Mittman, the updates have definitely added some cheer to the office. "Everyone absolutely loves it," said Mittman. "We are very pleased with the finished product!"